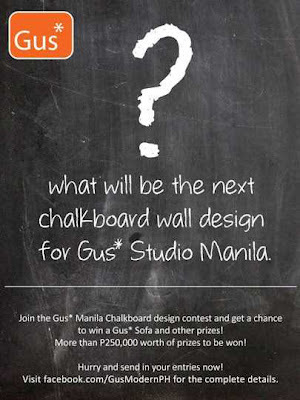 Gus* Chalkboard Design Contest ~ Philippine Freebies, Promos, Contests and MORE! Calling all professional Interior Designers and Architects and those with considerable experience in home/interior design, send in your entries for the Gus* Modern Chalkboard Wall Design Contest. Prepare your original design inspired by the theme: "Eco Friendly Modern Living" and submit the the digital (JPEG) format via email. Be included in the Top 10 semifinalists who will be posted on Gus* Studio Manila FB Page for online public voting. Encourage your friends to vote for your entry. Three winners will receive Trudeau 3-seater Sofa (black leather) worth P145,900, Span Dining Table (walnut) worth P79,000, and Henry Otoman (black) worth P56,900 respectively. Plus, the winning designs will be showcased as the new design of the Greenhills and Greenbelt showrooms. Theme: "Eco Friendly Modern Living"
20% Relevance to the theme - Adherence to the given theme "Eco Friendly Modern Living"